Record Of The Week is Osmose by one Ariel Kalma. An amazing Krautrock / nature hybrid. Warm washes of synthesizer, tribal war drums and drones galore all mixed with the sounds of the rainforest, crickets, frogs, even flies. So weird and wonderful. Music of the Rainforest - a breath of fresh air ! 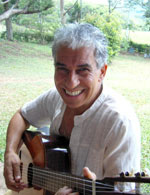 Ariel Kalma was recommended to Richard Tinti who had just come back from Borneo with hours of music of the rainforest: ambiences in high quality recordings. To their amazement, birds and keyboards, flutes and crickets, saxophones and frogs, war drums and (vintage) drum machines had much in common in terms of pitch, melodies, rhythms, effects. Ariel decided to blend his compositions with the rainforest atmosphere, and thus Osmose was created. For more CDs go to Ariel's catalog. "Ariel Kalma's magical and weird Osmose originally released in 1978 masterfully matches Richard Tinti's rainforest field recordings with Ariel's left field minimalist compositional ideas. Rather than simply relying on the rainforest sounds providing a pleasant backdrop to the drones, the drones interplay with the pitches of the natural sounds to create melancholic, Popol Vuh like grandeurs. The natural chirps and creaks blend with the music to become similar to ambient loops themselves; such that their very tonal nature shifts from being recognizable jungle sounds, frequently phasing into blurred rhythmic elements under the electronic parts. Ariel's musical minimalism avoids being serialist or academic, despite being part of the INA GRM studios for many years. So, neither is it concrete like Parmeggiani or Risset, nor is it classical like Philip Glass or Michael Nyman. If anything, Ariel's music is deeply cosmic, sometimes even a bit psych, ala the great Krauts of yore: old Tangerine Dream, Sand, Cluster etc. His cathedral like tones and running counterpoints actually give the rainforest noise a sinister edge. The music absolutely subverts the traditional idea of the rainforest as that of a happy hunting ground for cause riddled yuppies with Benzes full of Kruggerrands. Osmose reminds that not only is the rainforest a place of awe inspiring beauty, but it is also something very dense and alien. It is a place of removal; it is a place of isolation; it is a kind of inner space; it is an extraordinary and surreal church of sorts; and it is deadly. just wanted to let you know that OSMOSE is incredible! Thank you for making music! The album has a progression that's almost a story in toto, where the next rise is finally crossed revealing the huge, seemingly impenetrable expanse of lush greens. The expanse is then explored with wide eyed wonder until the guide dies and the companions start succumbing to fever, ague, snakes and unseen primitives at home in the shadows. Appended by 3 previously unreleased tracks from the same sessions, this reissue finally allows the rainforest to live up to its natural state of untamed jungle." Hailing from the realm of Tangerine Dream is this pleasant collection of original synth music paired with nature sounds, from French ambient pioneer Ariel Kalma. In 1977, the year of its original release, the recording was sophisticated enough in both concept and execution not to be at all your typical space-trip. The music on each track is blended with rain forest sounds from Borneo brought back to Paris by composer/recordist Richard Tinti and layered in tastefully, if not artfully. On certain of the tracks different instruments are featured, such as soprano saxophone (track number one, "Saxo Planetariel"); harmonium (number three, "Planet-Air"); flute (played modally through "Forest' Ballad"); and guitar and organ (the also-remarkably-titled "Orguitar Soir"). Kalma himself claims to have employed a "circular breathing" technique whilst recording his wind instruments, a physiological twin to the classic technique of tape-looping, which is also featured in spades. Recorded during a concert under the stars of the Paris' Planetarium (1977) with soprano saxophone, circular breathing, long delays, keyboards, and effects (but no samples, loops or overdubs). Mixed later with the rainforest at night. "I wanted to send a musical message from earth that night." With keyboards, vocals, flangers, long delays, Q filters, and dusk creatures from the jungle. Recorded at GRM studios, Paris. Recorded on the newly tuned big harmonium of the small church of St Julien du Sault, France: the light of a full moon coming through the stained glass windows, birds of Borneo. A silver flute echoes ever changing harmonic waves of flanged keyboards and tuned reverbs amongst the trees of the rainforest, and as the sun gets hotter, morning birds and insect alike revel in a crescendo of sounds. Composed in the 'repetitive' style of the seventies, with 3 keyboards and their simplistic rhythm boxes, echoes, phasing, flanger and vocals. Recorded at Ariel's Astral Muse home studio, then overdubbed at the GRM studio with frogs, fireflies and all kinds of night creatures' calls. Ride the haunted rainforest merry-go-round. Dusk crickets, birds, birdcalls, harmonium, vocals, delays, keyboard, and a fly. A saxophone gently stirs up the night forest. guitar and flanged keyboard (tuned in a Morrocan G'nawa music style) lounge in a summer glade, intermittently pierced by birdsong.